St. Patrick’s Day in Atlanta features events that run the gamut from outright celebrations to tests of physical endurance. Whether you want to celebrate the Irish with the entire city or support the many thousands of runners that take to the streets of neighborhoods throughout the city, St. Patrick’s Day is a great day to visit Atlanta. Check out the annual St. Patrick’s Day Parade in Midtown, one of the South’s biggest and oldest celebrations of its kind. The family-friendly parade features more than 2,000 Irish dancers, musicians, balloons, floats, local and Irish dignitaries, the Clydesdales and the world’s largest Irish walking flag. A number of Atlanta bars honor St. Patrick’s Day with special events. Next to Piedmont Park, Park Tavern hosts its annual LEPRE*CON celebration with live bands and green beer all day long. At Atlantic Station, check out ShamRock the Station, one of Atlanta’s biggest family-friendly St. Patrick’s Day celebrations with Irish dancing, face painting and balloon art. Pack up all your cares and woe, then head to a festival in Atlanta. 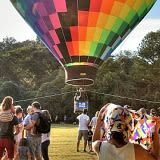 Shake the winter chill and make a beeline to one of Atlanta’s vibrant springtime festivals celebrating music, films, historic sites, exquisite art, tours and more. Got a green outfit and food coloring? You're ready to celebrate St. Patrick's Day in Atlanta. Feeling a bit Irish this month? Visit one of these popular Irish pubs in Atlanta. 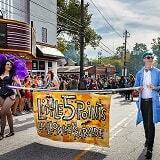 Get out of the house and have a ball at a March festival in Atlanta. Atlanta's abundance of parks makes for the perfect daytime outing! Take it from an Irishman: Atlanta is plenty green.